The alarm was set for 8am because our plan was to Kayak early, at low tide, before we departed. However, the cold and the low ceiling got the better of us and we huddled in the boat until noon. 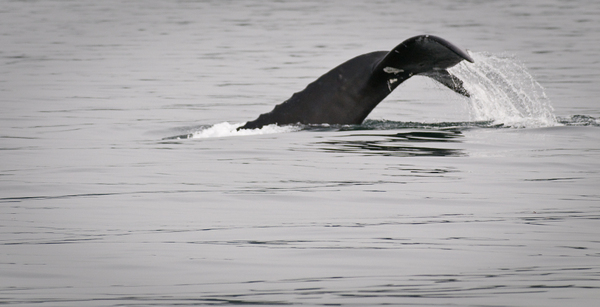 We spent the morning listening to the VHF radio on the “Whale channel” to get insight into whale activity from the whale watching boats.The reports indicated that the Orcas were resting at Robson Bight, but as the morning wore on the activity increased in the Strait. Therefore, we formed a plan that included lunch at a very small day anchorage and then down to Cracroft Point to see the Orcas. Our lunch spot at Cedar Island had only 4 feet of water at mean low water and our boat draws 4 and half feet, so the only way we were able to anchor was the fact that we had a high spring tide. We worked our way through the kelp-lined entrance and set anchor in the muddy and sea grass laden bottom. 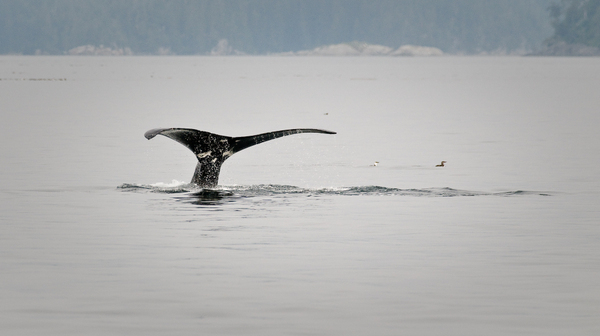 I had seen the spouts of Humpback Whales off in the distance, so we changed course and headed their way. We spent about forty-five minutes with the engines at idle watching these amazing creatures. There was a large male and a female with a calf in tow. Other Humpbacks fed off in the distance, but these three managed to stay near our boat. 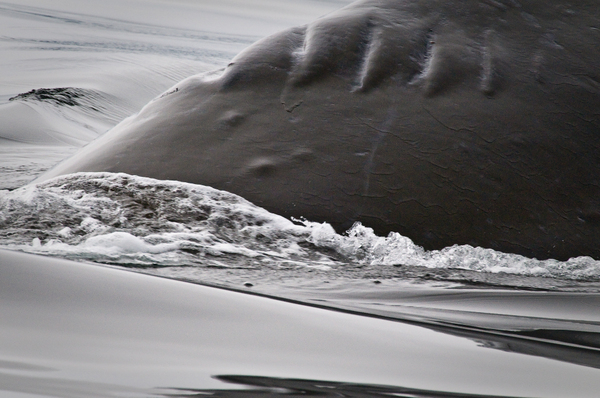 In fact, once the mother and calf surfaced just 50 feet from our boat. They were so close, I could only include about one square foot of mom with my long telephoto lens…but the sound and sight of them so close was unforgettable. We continued on with our tour’s original plan and headed to Cracroft Point, where we had watched the Orcas yesterday. By this time it was after 4pm and all but three had left the area. We sat and watched for a while before heading to our overnight anchorage in Double Bay.Today’s forecast was for the fog to lift by noon and to reform in the afternoon. It took the sun until about 2:30 to clear the skies so we could enjoy a beautiful afternoon where the temperature finally broke 60F. As we made our way to Double Bay, we could see a very large fog bank approaching. It was wild to see one island after another be consumed by the white. There was a cruise ship coming down Blackney Passage and all we could see was the lower half of the boat. The poor captain must have thought he was stuck in a permanent fog. This was one time it was good to be in the cheap cabins in the lower decks. The holding in Double Bay was good in mud and no sooner than we set anchor, the fog blanketed the bay. We saw one very large sea lion as we motored into the bay, and heard him snorting and noise-making a few times later that evening. 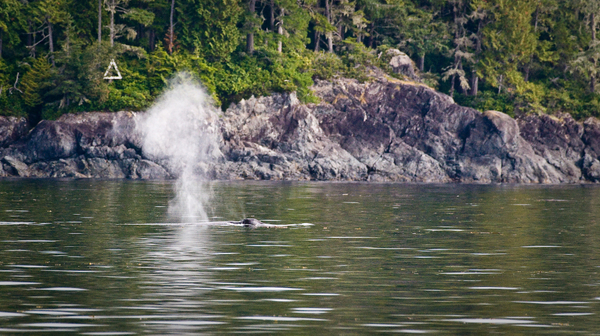 All in all another great day with lots of sightings of wildlife: Orcas, Humpback Whales and even a couple of Sea Lions.